Share the post "Quick plays: RUSTY SHACKLE, STEPHEN KELLOGG, THE DUNWELLS, ROD PICOTT"
Rusty Shackle appear to have tripped over the ‘difficult second album’ stepping stone with the follow up to their 2012 debut album Wash Away These Nights which was a more varied offering than the ‘pedal to the metal’ hoedown of The Bones. Retreating to the Monnow Valley Studios in Monmouth, the alternative folk Welsh quintet wrote the songs for The Bones jamming and throwing ideas about. And then set about recording them ‘live’ in the studio. And while it sounds like they had a blast, and the album should play out well live, it does very much have a ‘knees up’ ambience with an abundance of ‘da, da da, da da dum’ sing along lines. It’s perhaps ironic that American singer/songwriter troubadour Stephen Kellogg’s Blunderstone Rookery album should be released on Bread and Butter Records, because it’s staple Americana folk/country rock. And while he may be an unfamiliar name on this side of the pond he’s got a significant back catalogue stretching back almost decades both as a solo performer and as Stephen Kellogg and The Sixers. Routed in the likes of Jackson Browne (who gets name checked on ‘I Don’t Want to Die On The Road’) territory with Springsteen elements (‘Good Ol’ Boys’ with its Clarence Clemons style sax work is typical of some of The Boss’ earlier blue collar output), it’s a supremely easy listen that echoes elements of Tom Petty, Tom Fuller, and Welsh singer songwriter Al Lewis. We were pretty damn impressed at GRTR! 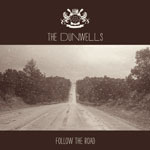 with Leeds originating The Dunwells debut album Blind Sighted Faith (2012) with its organic blend of acoustic and electric soft rock derived from a formative diet of artists such as The Beatles, Fleetwood Mac and countless other classic acts from the sixties onwards. And we weren’t the only ones. The Americans – who know a thing or two about soft rock – took to the band to the extent of signing them to an American label. Blind Sighted Faith got a release there late 2012 and a re-release back here earlier this year. And now we get Follow The Road. But hold on – a quick glance at the credits and track listing reveals that Follow The Road is essentially yet another re-issue of their debut album sharing nine of the 11 tracks (albeit half are in acoustic or remixed form) and two new numbers – ‘So Beautiful’ (which featured on the first re-issue) and ‘Saving Grace’. So not a lot of extra bang for your bucks. Now some may consider that something of a con, and let’s be honest, it is. Or is it? The consensus on Amazon purchase ‘reviews’ seems to be ‘buy it anyway’, but they have a suspiciously common theme. Having given up his day job as welder to pursue a career in music, Welding Burns was an appropriate title for this Maine County, USA singer songwriter’s last outing in 2011. Kickstarter funding allowed this follow up to be produced by Nashville producer R S Field and deliver what Piccott considers to be the best sounding album of his career. Which is sort of sad, because the word that springs to mind to describe Hang Your Hopes is ‘lacklustre’. I’m not looking to be unkind, and Piccot will be the first to admit he’s not seeking household name status, but his low key soft deliver and songs simply lack pizzazz. Troubadour in style more than true-grit Americana, he’s simply not going to start any bush fires burning with this release, although ‘Where No Man Knows My Name’ does at least have, in parts, a decent enough early 1970′s Neil Young ring to it. Formed around vocalist/songwriter Kevin Peroni, Wiretree are a pleasant enough pop meets indie rock band. Peroni’s vocals are easy on the ear and a song like ‘To The Moon’ is a blissful hit of indie pop. Elsewhere the tunes fly by the listener’s ears but never really grab hold and have you putting a song on repeat play. ‘In the City (Rail)’ features crashing cymbals and twanging guitar solos beloved of R.E.M. in their IRS years, another great song. The album has promise and I think there next album will be the one that will be a ‘must have’, until then this will keep things bubbling along nicely. This entry was posted in ALBUM REVIEWS, ALBUM REVIEWS (Mobile), All Posts, Quick Plays and tagged album, Blunderstone Rectory, Follow The Road, Get Up, Hang Your Hopes On A Crooked Nail, Kevin Peroni, review, rock, Rod Picott, roots, Rusty Shackle, singer, songwriter, Stephen Kellogg, The Bones, The Dunwells, Wiretree. Bookmark the permalink.